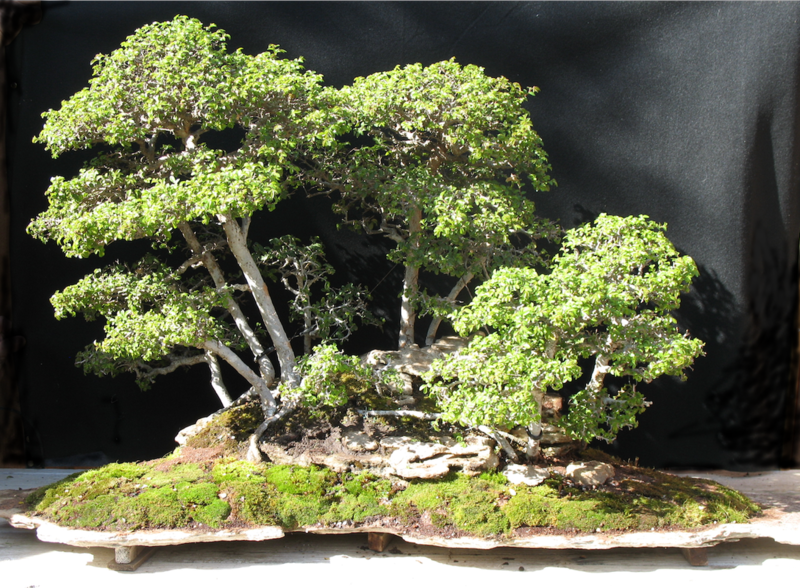 This bonsai is grown in the forest style. 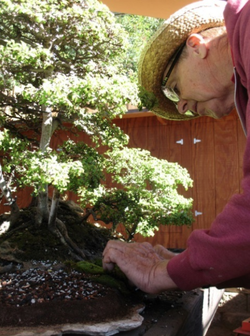 Melba Tucker became interested in bonsai in 1956 as a student of Khan Komai and began teaching bonsai a decade later. 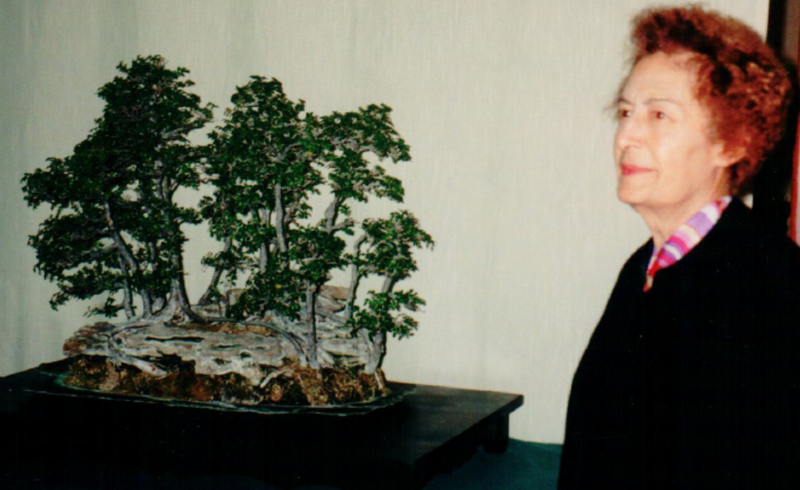 She taught bonsai, saikei, and suiseki worldwide and was very generous in her financial support of many bonsai and suiseki organizations. Melba's book on the American perspective of suiseki (Suiseki & Viewing Stones: An American Perspective) was published in 1996 and in that same year the Suiseki Pavilion in the US National Arboretum in Washington D.C. was named in her honor. Melba also published a book entitled Suiseki & Viewing Stones. 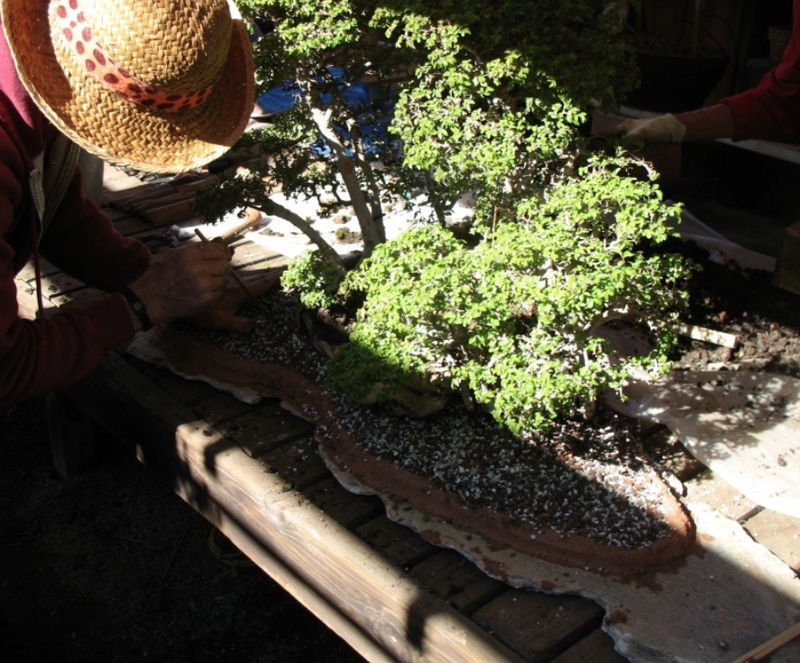 Melba was president of the Santa Anita Bonsai Society and a member of four other bonsai clubs including the California Bonsai Society. 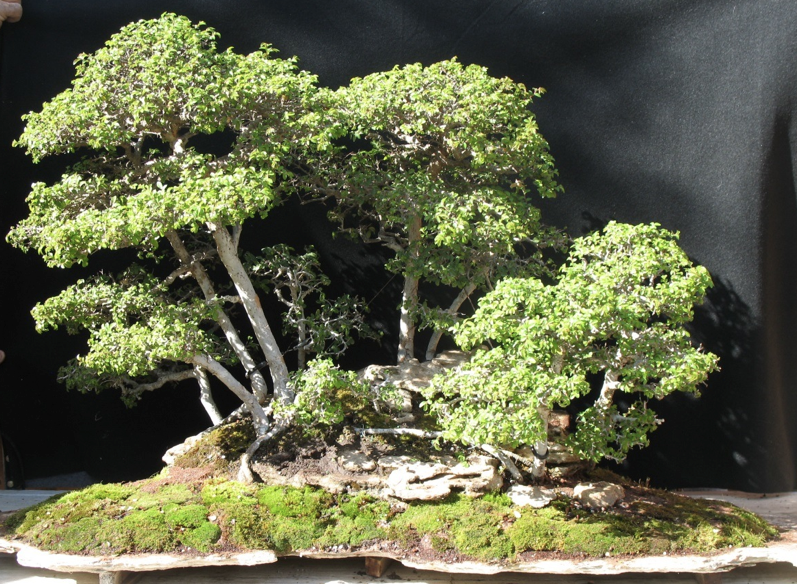 She served as treasurer of Bonsai Clubs International for a total of 18 years. Melba maintained a personal bonsai collection of over one hundred show trees of all styles. 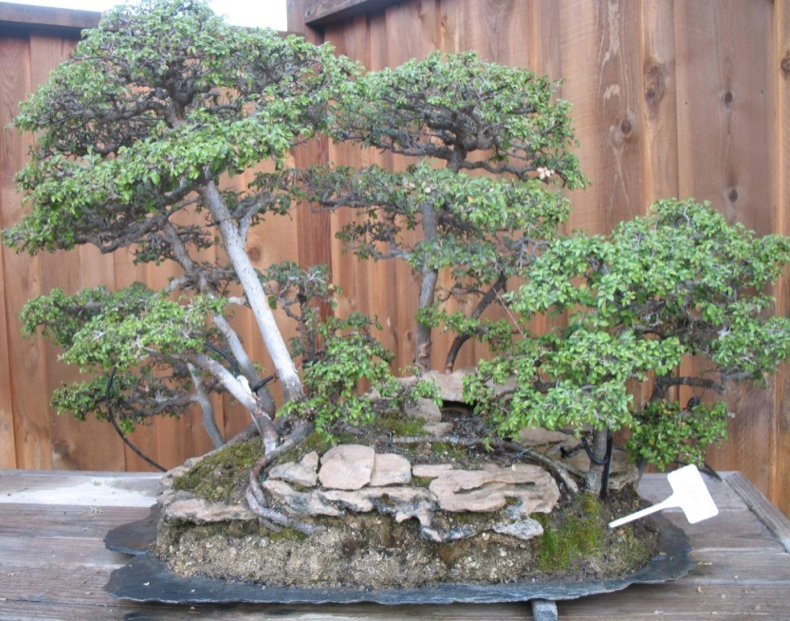 The bonsai collection at the San Diego Safari Park is lucky enough to have her Catlin elm forest on display. The forest was donated by Melba’s estate in 1999. The photo above of Melba Tucker was taken just before she passed away in 1999. A photo of Melba Tucker’s elm forest as it was in 2012 is shown on the left. Note the small black slate slab it is displayed on. ‘lyn Stevenson had an idea to transplant the forest on a larger slab carved by Brian Jackson, John Jackson’s brother. Brian carved the slab from a rectangular rock slab using a ballpeen hammer. Brian is very talented indeed. 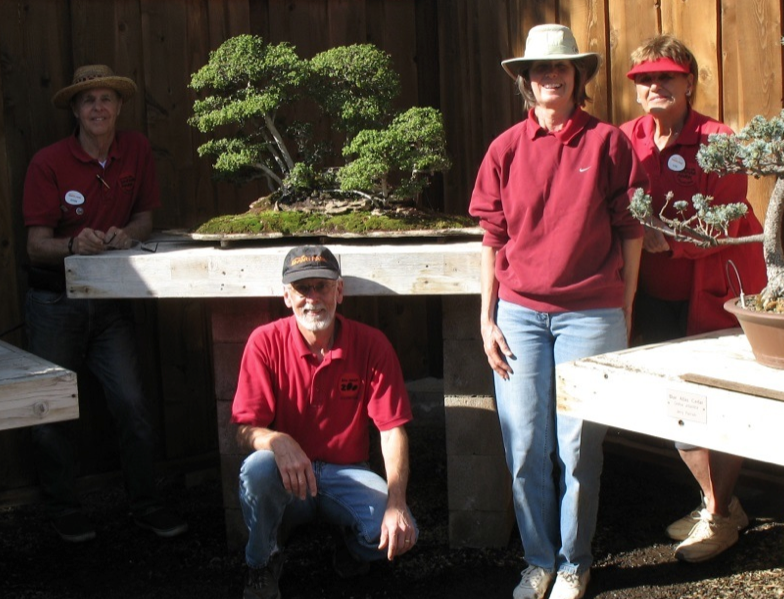 On January 23, 2014, John Jackson, ‘lyn Stevenson, and Cathy and Mark Edgar repotted Melba’s forest onto the new slab. It had been many years since the forest was repotted, but the process was much easier than it looks. 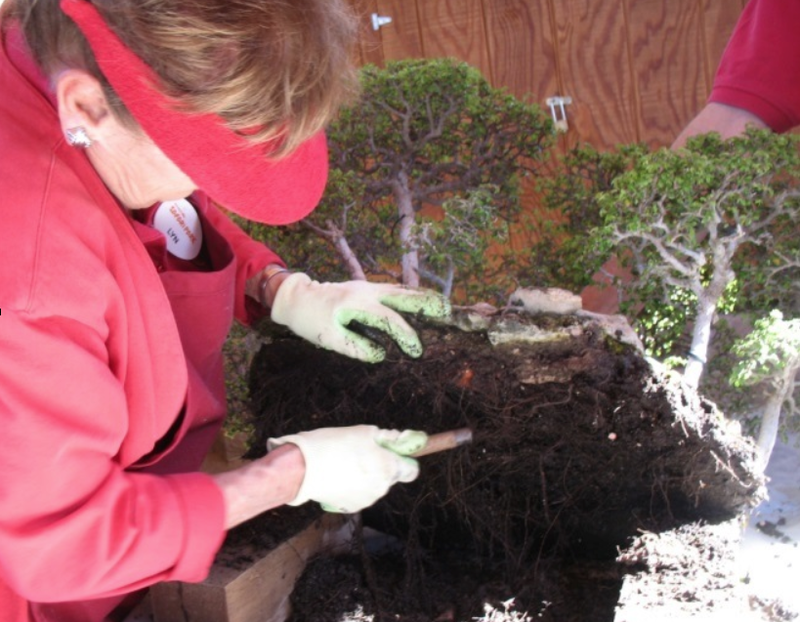 The forest was lifted from the old slab in one piece and the old soil and larger roots were removed (the forest remained in one piece during the whole repotting process). ‘lyn is removing old soil. The “cleaned” forest was positioned on the new slab prior to adding the muck wall and soil. 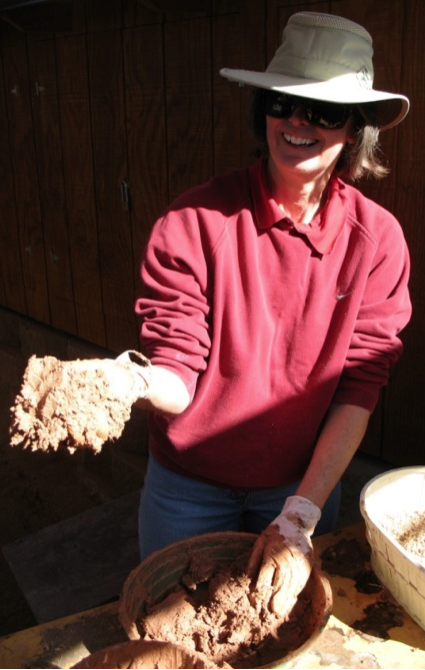 Cathy is making muck – just like bread. Muck is made by mixing clay, sphagnum moss, and water until it putty-like. John is adding the finishing touches to the muck and the soil. The tree was lifted from the slab and soil was added to the slab and the forest was settled on to the mound of soil. The muck was rolled into long “cigars” and pressed onto the slab. A wall was built in the shape that would become the outer boarder of the forest. Close up of the muck wall after all the soil was added. John is adding moss. Moss was added over almost all of the soil surface and the muck wall to keep the soil in place. Several other trees donated their moss to the effort.